Reginald, please see who that is at the door- there’s a good fellow. Oh Beatrice, the life of an extravagant millionaire is so taxing. So many investments to oversee, so little time- in fact, one hardly has time to enjoy the fruits of one’s labors, don’t you find? If only there were something to brighten up this town of ours- something in which one could invest one’s time for a truly worthwhile result. What’s that, Reginald? 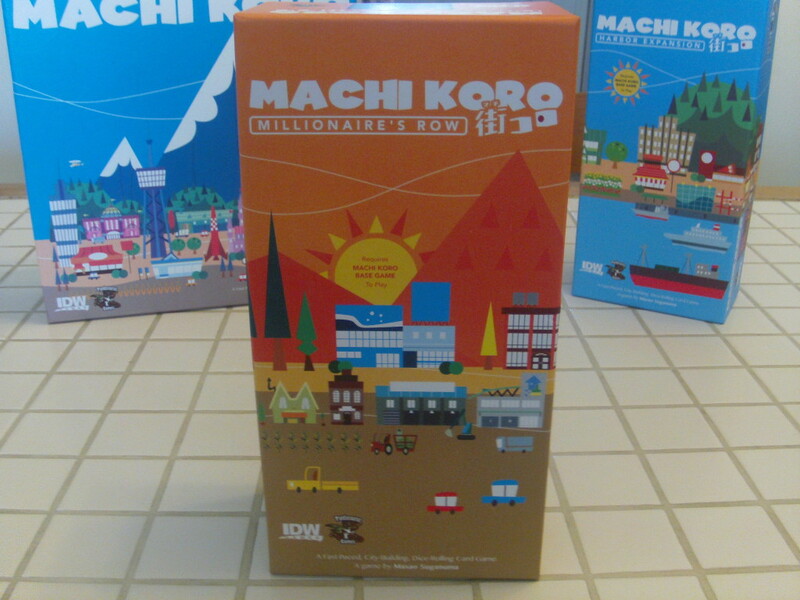 A new expansion for Machi Koro has arrived from Pandasaurus Games and it’s called Machi Koro: Millionaire’s Row? Well, what are you waiting for? Bring it in, man! 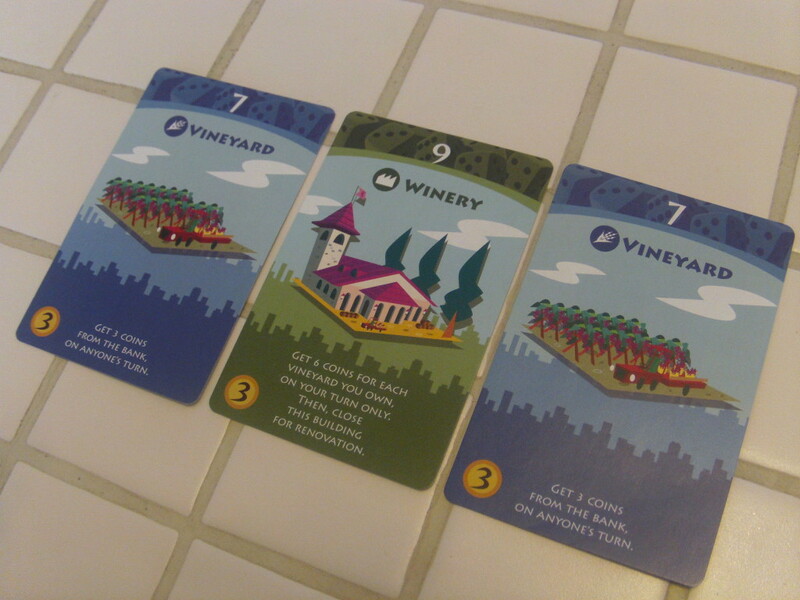 It would appear that this expansion to Machi Koro (which can, incidentally, be combined with the previous expansion, Machi Koro: Harbor Expansion) adds an additional 20 Major Establishments (the purple cards) and 60 Establishments (the blue, green, and red cards). Unlike the previous expansion, there are no additional players, new landmarks, or coinage added. However, what has been added instead are a new token, more complex mechanics, and above all: game length. Let’s start with this nifty token: the Renovation Token (which shares the same symbol as the unconstructed side of your landmarks- a nice touch, I thought). Several of these new Establishments will require you to put an Establishment under renovation. 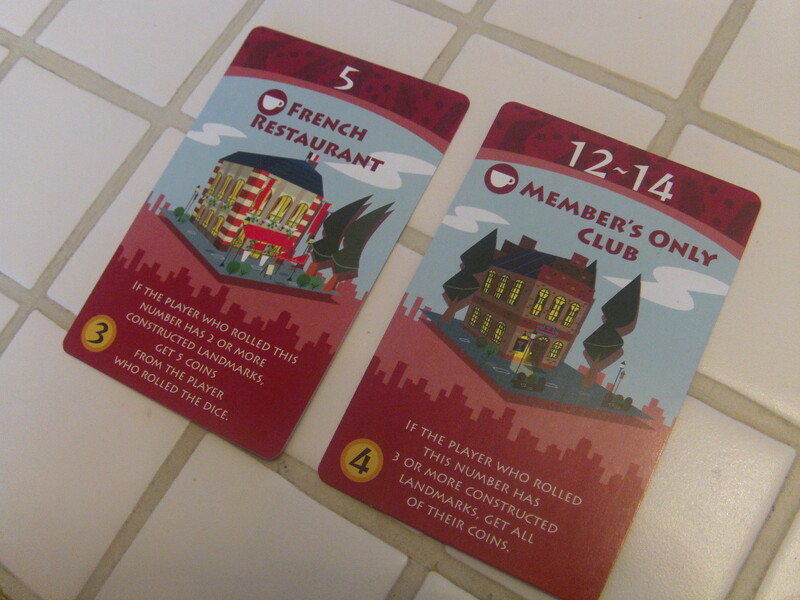 Simply place a Renovation Token on the requisite card and presto- that Establishment is under renovation. What this means is that the next time that card is activated, instead of doing the action printed on the card, you simply remove the Renovation Token. This can throw a real wrench into the finely tuned machine that is your bustling town. Many other Establishments have similarly vexing mechanics. For instance, when the Park is activated, all players pool their money together and then evenly redistribute it again- a socialist’s dream come true. Or there is the Tech Startup. On your turn, you may place a single coin on the Tech Startup as an investment. You no longer have access to this money but when the Tech Startup is activated, each player must pay you the total amount you have invested. Or there is the Demolition Company. When activated, this card forced you to demolish one of your constructed Landmarks by flipping it back to its gray side, after which you receive 8 coins from the bank. There are Establishments that cause you to take all of a player’s money. There are Establishments that cause you to give away other Establishments you own. There is even an Establishment that as soon as it is used, it is returned to the Marketplace. All of these cards have the potential to make this game last much longer than it already does. 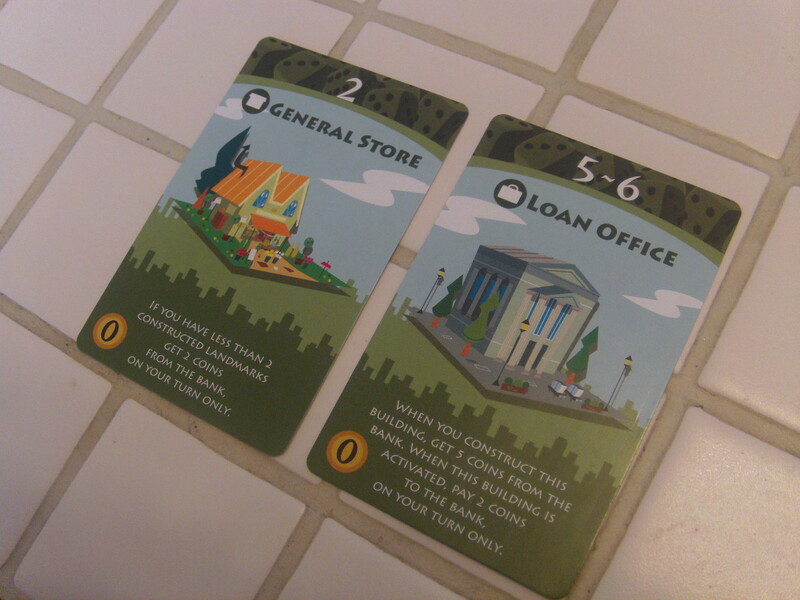 And herein lies the problem with Machi Koro: Millionaire’s Row: the new Establishments certainly add some more variety to the game and the new mechanics add more complexity, forcing you to change your (at this point) well-honed strategies. The thing is, I’m not sure that they make the game more fun. They certainly make the game last longer- with all the money flying back and forth between players, the game changes dramatically from one of building a finely tuned engine to building a Pong arcade game. It isn’t necessarily bad, I’m just not sure if it is really an improvement. 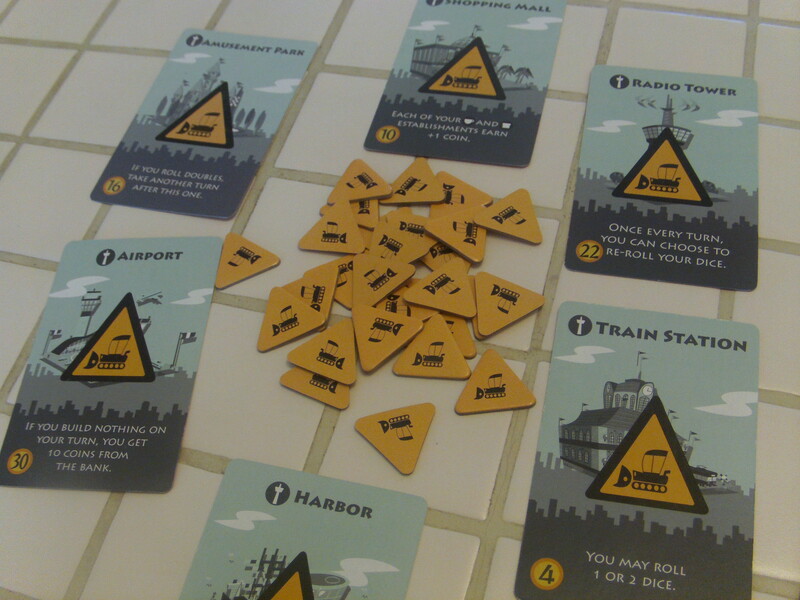 However, if after the last expansion you started to feel that your games of Machi Koro were starting to drag, you might not want to combine it with this new one. What’s more, if you’re playing Machi Koro with both expansions, the sheer amount of card you will need to shuffle before starting a game is rather unwieldly. Thought you had issues shuffling the cards needed for a game of Sheriff of Nottingham? Well, you haven’t seen anything yet, dear reader. In conclusion, I’m somewhat indecisive when it comes to this expansion. It adds some interesting new things to Machi Koro, but it also can cause games to last quite a while. I would advise that this expansion be obtained only by those who are die-hard Machi Koro fans, or those who really enjoy the game but have grown somewhat bored with it. It certainly makes things interesting, that’s for sure. Approach this one with caution, dear readers.